If you would like to explore your genetic health and wellness, as well as other traits influenced by your DNA, you may want to know whether Helix or Vitagene is a more suitable choice for you. While they are both good companies with stellar reputations, they do not offer the same tests or health reports. When choosing a DNA testing company, it is important to clearly define what you are looking for and choose accordingly. In the table below, you can compare these two DNA testing providers, viewing their offers side by side. 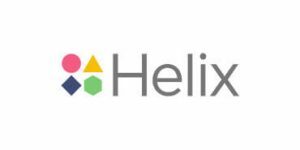 This can help you easily and quickly decide whether Helix or Vitagene meets your expectations and delivers the data you are interested in. Unique combination of genetic tests. Vitagene is a company that turns your DNA information into actionable health plans, including recommendations regarding your diet, fitness, skin care, and supplementation. Vitagene offers one ancestry DNA test - Health + Ancestry Report. The results explore your ethnic percentages and include a health-related report as well. Vitagene follows all the industry standards regarding user privacy and security. Your personal DNA file will never contain any information that can identify you as an individual and the company will never share your data without your consent. Satisfied with the service, but I'm giving it 4 stars because I had to fill in a bunch of personal information about myself. Vitagene has a unique approach to analyzing your DNA, and that's what I love about this company. With it, I was able to find out a lot of things other companies couldn't tell me, and also get personalized supplements. Money well spent. English is not my first language but I know enought to understand that Vitagene is not designed by professionals. Here is some examples: 1 You have to pay first and then accept conditions,not the other way around. 2 Their language is not only unclear but wrong. They tell me to use dairy products like almon milk,soya milk,etc. But this is NOT a dairy product They tell me to eat grains like beans and peas. That is NOT a grain ! 3 In their questions they show the say sloppy use of words and concepts by asking questions like " do you eat a lot of fatty food ?". Hmmmm,yes I do I eat a lot of fat fish but I don't think they see this as "fatty food". Maybe everybody in The U.S. know the meaning of fatty food,but for users in other countries this is sloppy,unclear and un profesional ways to ask questions when the intent is to figure out if you have a healthy diet or not. 4 When they tell me what to eat the list is so small,so limited that nobody can prepare any meal based on their advice 5 There are more but I get so distressed by writing about Vitagene that I stop here. My advice is clear " Do not buy this test ! " Vitagene worked great! I did the DNA test and got my health and fitness reports in about 3 weeks. I really liked their supplement recommendations too.